Compass & Coffee Spoons: Hey, Jicama! I tried something new for dinner tonight. I've had jicama (pronounced HE-ka-mah for those not priviledged enough to have minored in Spanish or to watch Food Network on cable) before, usually as a slaw accompanying a protein in a froo froo restaurant or raw on a vegetable plate at a catered event, but I've never actually bought one at the supermarket myself...that is, until a week or so ago. I saw a lowfat dip recipe that recommended it as a dipper, which led me to buy it. However, I ended up not using it for that purpose, so I was curious if there were other prep methods other than as a slaw. I found that people bake them like fries. As you can imagine, I discovered through Googling that this was a popular topic on Atkins forums. I decided to try it, particulary as I was hunting for something lower in calories for dinner. 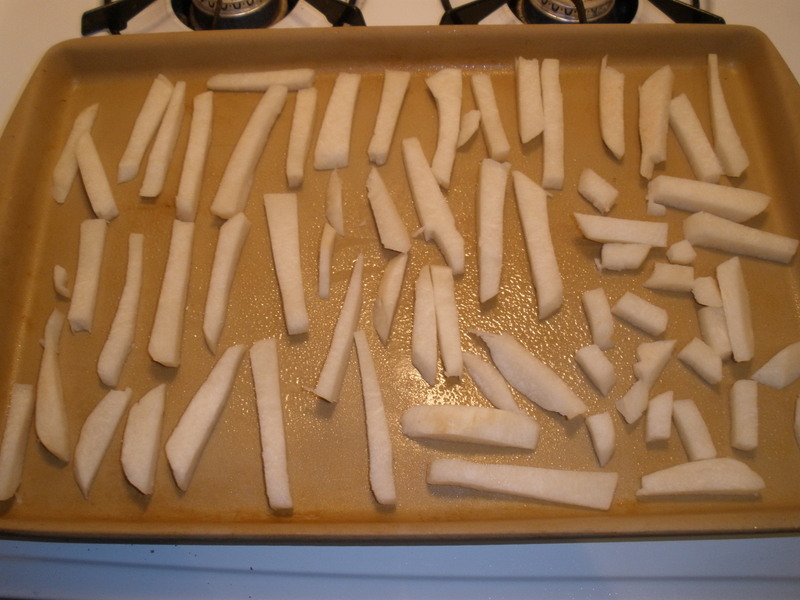 I peeled the jicama and cut it into fry-like matchsticks. It was tougher to peel and cut than a potato, but not as difficult as, say, a butternut squash! My potato cutter/fry maker thing that I rarely get to use wouldn't cut it, but it did make a nice template for my sharp knife to follow. I placed the resulting pieces on a baking stone covered in baking spray and then sprinkled them with ground chipotle, garlic powder, sea salt, white pepper, and sprayed them with my Misto full of olive oil. Don't get me wrong, there is not much risk of mistaking them for french fries. These are to fries as spaghetti squash is to spaghetti: good in its own right, not good as a substitute for the real thing unless you've been off the potato for a LONG time (like your whole life). (Note below the use of a lunch sized plate...which gives you a nice illusion of lots of food!) When I do it again, I'll cut the pieces thinner--they get a kind of burnt crispiness to them that way. Give it a whirl! 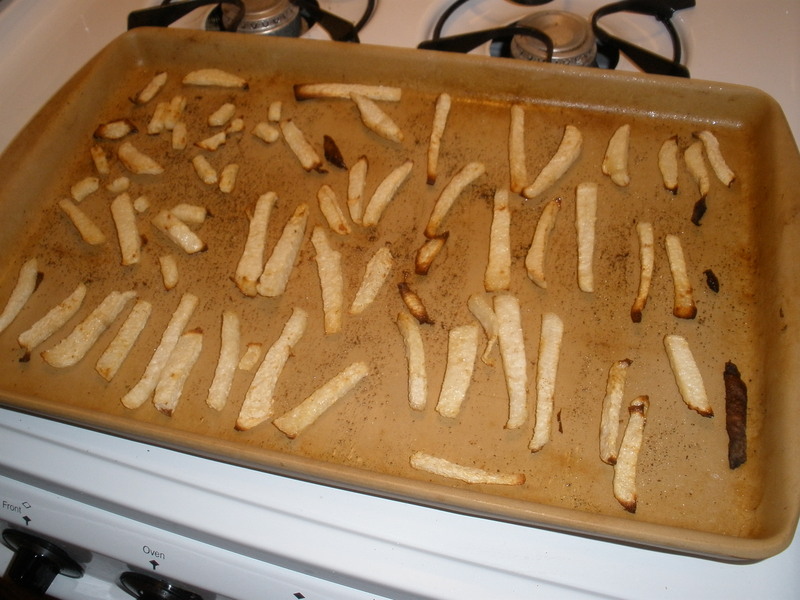 I had no idea jicama could be baked like fries. That sounds rather good, as my enthusiasm for fries comes and goes. I am very intrigued. I don't know if I'd recognize jicama in the grocery store though. 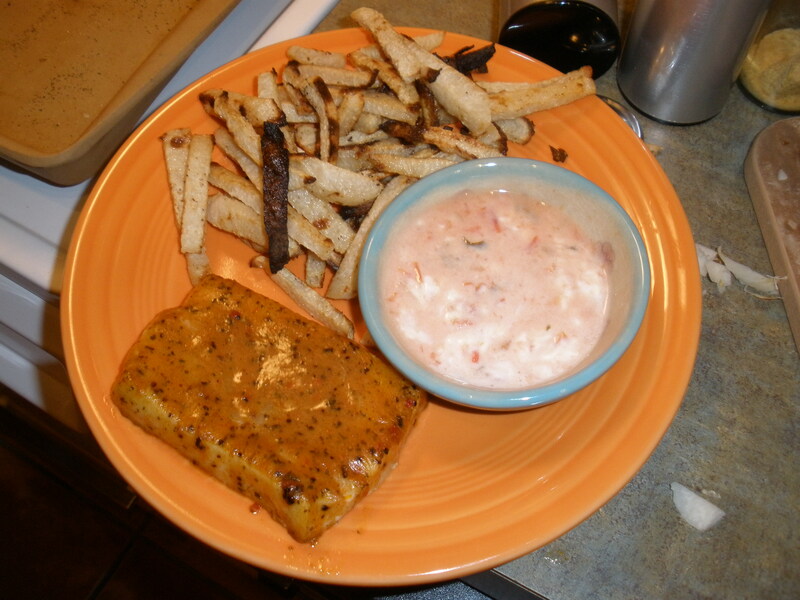 I am also a fan of sweet potato fries in the alterna-potato universe. Have you ever tried a mirliton? Sometimes known by their Mexican name of chayote, they are popular in New Orleans, though I'm not sure they're easy to find elsewhere. (I think I saw them in an Asian supermarket in Indianapolis once before though) They don't look anything like a jicama, but the texture is similar--not as sweet though. Louisianans typically cook them, hollow them out and stuff them with dirty rice and crawfish or something like that.